Marxist historian Eric Hobsbawm's account of the relationship between the prewar artistic avant-garde and the workers' movement of that period. Both converged in the late nineteenth century, diverged quite sharply in the first phase of radical 'modernism', but found each other again - at least for a few passionate years - under the impact of the Great War and the October Revolution. Both socialism as a mass movement and the cultural and artistic avant-garde as a widely recognized, self-conscious and sometimes separately organized representative of 'modernity' and 'progress’ within the arts are, as European phenomena, children of the last. decades of the nineteenth century. In this paper I propose to consider their relationship. There is no necessary or logical connection between the two phenomena, since the assumption that what is revolutionary in the arts must also be revolutionary in politics (or the other way round) is based on a semantic confusion of the various senses of the term 'revolutionary', or of analogous terms. On the other hand there is or was frequently an existential connection, since socialists (Marxist, anarchist or other kinds) and the artistic and cultural avant-garde were both outsiders, opposed to and by bourgeois orthodoxy. We may also mention the youth, and quite often relative poverty, of many members of the avant-garde and boheme. The poverty may be exaggerated, but the economic insecurity of young or heterodox artists and writers, petty producers of commodities for which no established market existed, is not to be underestimated, even though for many avant-gardists of bourgeois origins the choice of insecurity over a secure bourgeois existence was deliberate. Both groups of outsiders were to some extent pressed into a not unfriendly coexistence with each other and with other dissidents from the morals and value systems of bourgeois society. Politically revolutionary or 'progressive' minority movements attracted not only the usual fringe of cultural heterodoxy and alternative lifestyles -vegetarians, spiritualists, Theosophists and so on - but independent and emancipated women, challengers of sexual orthodoxy and young people of both sexes who had not yet made their way into bourgeois society, or rebelled against it in whatever way they thought most demonstrative, or felt excluded from it. Heterodoxies overlapped. Such milieus are familiar to every cultural historian. The small British movement of the 1880s provides several examples. Eleanor Marx was not only a Marxian militant but a free professional woman who rejected official marriage, a translator of Ibsen and an amateur actress. Bernard Shaw was a Marxist-influenced socialist activist, a self-made literary man, a hammer of conventional orthodoxy as a critic of music and drama, and a champion of the avant-garde in arts and thought (Wagner, Ibsen). The avant-garde arts-and-crafts movement (William Morris, Walter Crane) was drawn into (Marxian) socialism, while the avant-garde of sexual liberation - the homosexual Edward Carpenter and the champion of general sexual liberation, Havelock Ellis, operated in the same milieu. Oscar Wilde, though political action was hardly his field, was much attracted to socialism and wrote a book on the subject. Fortunately for the co-existence of the avant-garde and Marxism, Marx and Engels had written very little specifically about the arts, and had published even less. The early social democrats were therefore not seriously constrained in their tastes by classical doctrine. In fact Marx and Engels had shown no fondness for any contemporary avant-garde after the 1840s. How important and influential other socialist theories about the arts (for example the Saint-Simonian) remained in the 1880s is a question which requires further research. However, it is unlikely that they were considered authoritative in the new socialist movements. The absence of a body of authoritative aesthetic analysis obliged social democrats to evolve one. The most obvious criterion of contemporary arts acceptable to socialist labour movements - there was never any doubt about their admiration for the classics of national and international art and literature - was that they should present the realities of capitalist society frankly and critically, preferably with special emphasis on the workers, and ideally with a commitment to their struggles. This did not in itself imply a preference for the avant-garde. Traditional and established painters and writers could just as easily extend their subject-matter and their social sympathies, and in the 1870s-1890s many painters turned to the depiction of industrial scenes, workers and peasants, and some-times even labour struggles (for example, Sir Hubert Herkomer's Strike). While, by official 'salon' standards many of these artists might be regarded as moderately 'progressive' (for instance, Liebermann), they neither were nor saw themselves as artistic revolutionaries. Indeed in this manner we can easily explain the otherwise inexplicable pleasure which the Impressionists ... and the Naturalists ... take in all the unclean refuse of capitalist society; they live and work amid such rubbish, and moved by obscure instinct, can find no more tormenting protest to throw at the faces of those who torment them. But, he argued, this was at best a step toward a 'true' art. Nevertheless Neue Zeit, which opened its columns to 'modernists', reviewed or published Hauptmann, Maupassant, Korolenko, Dostoyevski, Strindberg, Hamsun, Zola, Ibsen, Bjornson, Tolstoi and Gorki. And Mehring himself did not deny that German naturalism was drawn to social democracy, even if he believed that 'bourgeois naturalists are socialist-minded, as feudal socialists were bourgeois-minded, no more and no less'. A second significant point of contact between Marxism and the arts was visual. On the one hand a number of socially conscious visual artists discovered the working class as a subject and were therefore drawn towards the labour movement. Here as elsewhere in the avant-garde culture, the role of the Low Countries, situated at the intersection of French, British and to some extent German influences, and with a particularly exploited and brutalized labouring population (in Belgium), is to be noted. Indeed the international cultural role of these countries - especially Belgium - was, at this period, more central than for some centuries past: neither symbolism nor art nouveau and later modernist architecture and avant-garde painting after the impressionists can be understood without their contribution. Specifically, in the 1880s the Belgian Constantin Meunier, one of a group of artists close to the Belgian Labour Party, pioneered what later became the standard socialist iconography of the 'worker' - the muscular, bare-chested labouring man, the emaciated and suff~ring proletarian wife and mother. (Van Gogh's explorations in the world of the poor became known only later.) Marxist critics like Plekhanov treated this extension of the subject matter of painting into the world of capitalism's victims with the usual reticence, even when it went beyond mere documentation or the expression of social pity. Nevertheless, for those artists primarily interested in their subject-matter, it built a bridge between their world and the milieu in which Marxism was debated. A more powerful and direct link with socialism came through the applied and decorative arts. The link was direct and conscious, especially in the British arts-and-crafts movement, whose great master William Morris (1834-96) became a sort of Marxist and made both a powerful theoretical as well as an outstanding practical contribution to the social transformation of the arts. These branches of the arts took as their point of departure not the individual and isolated artist but the artisan. They protested against the reduction of the creative worker-craftsman into a mere 'operative' by capitalist industry, and their main object was to create not individual works of art, ideally designed to be contemplated in isolation, but the framework of human daily life, such as villages and towns, houses and their interior furnishings. As it happened, for economic reasons the main market for their products was found among the culturally adventurous bourgeoisie and the professional middle classes - a fate also familiar to champions of a 'people's theatre' then and later. Indeed, the arts-and-crafts movement and its development, art nouveau, pioneered the first genuinely comfortable bourgeois lifestyle of the nineteenth century - the suburban or semi-rural 'cottage' or 'villa', and the style, in various versions, also found a particular welcome in young or provincial bourgeois communities anxious to express their cultural identity - in Brussels and Barcelona, Glasgow, Helsinki and Prague. Nevertheless, the social ambitions of the artist-craftsmen and architects of this avant-garde were not confined to supplying middle-class needs. They pioneered modern architecture and town-planning, in which the social-utopian element is evident - and these 'pioneers of the modern movement' often, as in the case of W. R. Lethaby (1857-1931), Patrick Geddes and the champions of garden cities came from the British progressive-socialist milieu. On the continent its champions were closely associated with social democracy. Victor Horta (1861-1947), the great architect of the Belgian art nouveau, designed the Maison du Peuple of Brussels (1897), at whose 'art section' H. Van de Velde, later a key figure in the development of the modern movement in Germany, gave lectures on William Morris. The socialist pioneer of Dutch modern architecture, H. P. Berlage (1856-1934), designed the offices of the Amsterdam Diamond Workers' Union (1899). The crucial fact is that the new politics and the new arts converged at this point. 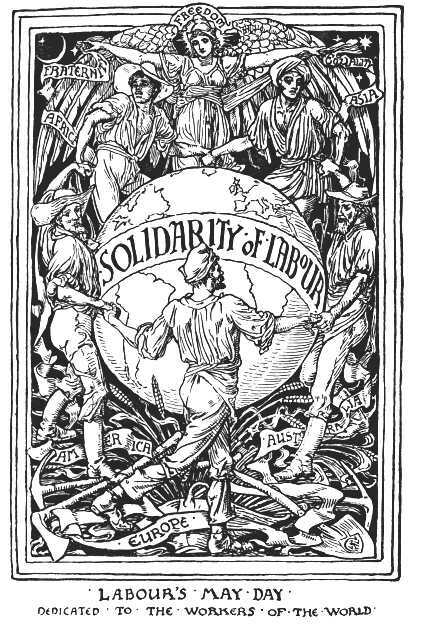 Even more significantly, the nucleus of the original (mainly British) artists who pioneered this revolution in the applied arts were not merely directly influenced by Marxism, like Morris, but also - with Walter Crane - provided much of the internationally current iconographical vocabulary of the social democratic movement. Indeed, William Morris developed a powerful analysis of the relations between art and society, which he would certainly have considered Marxist (since he was a Marxist), even though we can also detect the earlier influences of the Pre-Raphaelites and Ruskin. Curiously enough, orthodox Marxist thinking about the arts remained almost completely unaffected by these developments. William Morris' writings have not, to this day, made their way into the mainstream of Marxist aesthetic debates, though in recent years they have become much better known and have found powerful Marxist champions. No equally obvious links brought together the Marxists and the other main group of avant-gardists of the 1880s and 1890s, whom we may roughly call the symbolists. Yet it remains a fact that most symbolist poets had revolutionary or socialist sympathies. In France, like most of the newer painters of the period - the older impressionists were, with odd exceptions like Pissarro, rather a-political - they were chiefly attracted to anarchism in the early 1890s. Presumably this was not because they had any objection in principle to Marx - 'the majority of young poets' who were converted 'to the doctrines of revolt, whether those of Bakunin or Karl Marx', probably would have welcomed any suitably rebellious banner - but because the French socialist leaders (until the rise of Jaures) did not inspire them. The schoolmasterly philistinism of the Guesdists in particular would hardly attract them, while the anarchists not only took a much greater interest in the arts, but certainly contained significant painters and critics among their early militants - for example, Felix Feneon. Conversely in Belgium it was the Parti Ouvrier Belge which attracted symbolists, not only because it included the anarchizing rebels, but also because the group of its leaders or spokesmen who came from the cultured middle class were visibly and actively interested in the arts. Jules Destree wrote extensively about socialism and art and published a catalogue of Odilon Redon's lithographs, Vandervelde frequented poets. Maeterlinck remained associated with the party until almost 1914, Verhaeren almost became its official poet, the painters Eeckhout and Khnopff were active in the Maison du Peuple. It is true that symbolism flourished in countries where Marxist theorists keen to condemn it (like Plekhanov) were hardly present. Relations between artistic and political revolt were thus amicable enough. Hence, until the end of the century, a good deal of common ground existed between the cultural avant-gardes and the arts admired by discriminating minorities on the one hand, and the increasingly Marxist-influenced social democracy on the other. The socialist intellectuals who became leaders in the new parties - characteristically born around 1860 - were still young enough not to have lost contact with the tastes of the' advanced'; even the oldest, Victor Adler (1852) and Kautsky (1854), were still well below forty in 1890. Victor Adler, a frequenter of the Cafe Griensteidl, main centre of Viennese artists and intellectuals, was thus not only deeply impregnated with classical literature and music, but also a passionate Wagnerian (like Plekhanov• and Shaw he stressed the revolutionary and 'socialist' implications of Wagner more than is usual today), an enthusiast for his friend Gustav Mahler, an early champion of Bruckner, an admirer, in common with almost all socialists of this generation, of Ibsen and Dostoyevski, and profoundly moved by Verhaeren, whose poems he translated. Conversely, as we have seen, a large part of the naturalists, symbolists and other 'advanced' schools of the time were drawn towards the labour movement and (outside France) social democracy. The attraction was not always lasting: the Austrian litterateur Hermann Bahr, who fancied himself as a spokesman of the 'moderns', veered away from Marxism at the end of the 1880s, and the great naturalist Hauptmann moved in a symbolist direction which confirmed the theoretical reservations of Marxist commentators. The split between socialists and anarchists also had its effects, since it is clear that some (particularly in the visual arts) had always been attracted by the pure rebellion of the latter. Still, the 'moderns' felt at home in the neighbourhood of the labour movements, and the Marxists, at least the cultured intellectuals among them, with the 'moderns'. For reasons which have not been adequately investigated, these links were broken for a time. Some reasons may be suggested. In the first place, as the 'crisis in Marxism' demonstrated in the late 1890s, the belief that capitalism was on the verge of breakdown, the socialist movement on the verge of revolutionary triumph, could no longer be maintained in Western Europe. Intellectuals and artists who had been drawn to a broad, vaguely defined movement of workers by the general air of hope, confidence, even utopian expectation which it generated round itself now faced a movement uncertain of its future prospects and riven by internal and increasingly sectarian debates. This ideological fragmentation was also present in eastern Europe: it was one thing to sympathize with a movement all of whose currents appeared to converge in a generally Marxist direction, as in the early 1890s, or with Polish socialism before the split between nationalists and anti-nationalists, and quite another to make a selection between rival and mutually hostile bodies of revolutionaries and ex-revolutionaries. In the West, however, there was the additional fact that the new movements became increasingly institutionalized, involved in the daily politics which were unlikely to excite artists and writers, while they became in practice reformist, leaving the future revolution to some version of historical inevitability. Moreover, institutionalized mass parties, often developing their own cultural world, were less likely to favour arts which a working-class public would not readily understand or approve. It is true that the subscribers to German workers' libraries increasingly abandoned political books for fiction -while also reading less poetry and classical literature; but their most popular writer, almost certainly Friedrich Gerstaecker, an author of adventure tales, would not inspire the avant-garde. It is hardly surprising that in Vienna Karl Kraus, though initially much drawn towards the social democrats by his own cultural and political dissidence, moved away from them in the 1900s. He blamed them for not fostering a sufficiently serious cultural level among the workers, and was not inspired by the party's major - and eventually victorious - campaign for universal suffrage. The revolutionary left of social democracy, initially somewhat marginal in the West, and the revolutionary syndicalist or anarchist tendencies were more likely to attract avant-garde culture of a radical turn of mind. After 1900 the anarchists in particular increasingly found their social base, outside some Latin countries, in a milieu composed of bohemians and some self-educated workers, shading over into the lumpenproletariat - in the various Montmartres of the Western world - and settled down into a general subculture of those who rejected, or were not assimilable by, 'bourgeois' lifestyles or organized mass movements. This essentially individualist and antinomian rebellion was not opposed to social revolution. It often merely waited for a suitable movement of revolt and revolution to which it could attach itself, and was once again mobilized en masse against the war and for the Russian Revolution. The Munich soviet of 1919 gave it perhaps its major moment of political assertion. Yet both in reality and in theory it turned away from Marxism. Nietzsche, a thinker who was for fairly obvious reasons deeply unattractive to Marxists or other social democrats, in spite of his hatred of the 'bourgeois', became a characteristic guru of anarchist and anarchizing rebels, as of non-political middle-class cultural dissidence. Conversely, the very cultural radicalism of avant-garde developments in the new century cut them off from workers' movements whose members remained traditional in their tastes, inasmuch as they (and the movement) remained attached to the understood languages and symbolic codes of communication which expressed the contents of works of art. The avant-gardes of the last quarter of the century had not yet broken with these languages, though they had stretched them. With a little adjustment it was perfectly possible to discern what Wagner and the impressionists, or even a good many of the symbolists, 'were about'. From the early twentieth century - perhaps the Paris Salon d'Automne of 1905 marks the break in the visual arts - this was no longer so. Moreover, the socialist leaders - even the younger generation born after 1870 - were no longer 'in touch'. Rosa Luxemburg had to defend herself against the charge of not liking the 'modern writers'; but though she had been much moved by the avant-garde of the 1890s, such as the German naturalist poets, she admitted that she did not understand Hofmannsthal and had never heard of Stefan George. And even Trotsky, who prided himself on much closer contact with new cultural fashions - he wrote a lengthy analysis of Frank Wedekind for Neue Zeit in 1908 and reviewed art exhibitions- does not appear to show any specific familiarity with what the adventurous young in 1905-14 would have regarded as the avant-garde - except, of course, in Russian literature. Like Rosa Luxemburg he noted and disapproved its extreme subjectivism - its capacity, in Luxemburg's words, to express 'a state of mind' - but nothing else ('but one cannot make human beings with states of mind'). Unlike her, he attempted a Marxist interpretation of the new trends of subjectivist rebellion and the 'purely aesthetic logic' which 'naturally transformed the revolt against academicism into a revolt of self-sufficient artistic form against content, considered as an indifferent fact'. He ascribed it to the novelty of life in the environment of the modern giant city, and more specifically to the expression of this experience by the intellectuals who lived in these modern Babylons. No doubt both Luxemburg and Trotsky echoed the particularly strong social preconceptions of Russian aesthetic theory, but at bottom they reflected a very general attitude of Marxists, Eastern or Western. Someone particularly interested in the arts and anxious to maintain contact with the latest trends might develop a taste for some of these innovations as private individual, but how exactly was such an interest to be linked to his or her socialist activities and convictions? It was not simply a matter of age, though few of the established names in the International were below thirty in 1910, and most were well into middle age. What Marxists understandably failed to appreciate was what they saw as a retreat (rather than, as the avant-garde saw it, an advance) into formal virtuosity and experiment, an abandonment of the content of the arts, including their overt and recognizable social and political content. What they could not accept was their choice of a pure subjectivism, almost solipsism, such as Plekhanov detected in the cubists. It was already regrettable, if explicable, that 'among the bourgeois ideologists who go over to the side of the proletariat there are very few practitioners of the arts' (Künstler); and in the years before 1914 there seemed to be even fewer who were drawn towards the workers' movement than before 1900. The avant-garde of French painters was 'a l'ecart de toute agitation intellectuelle et sociale, confines dans les conflits de technique' . But there was more to it than this. In 1912-13 Plekhanov could state as something evident that 'the majority of today's artists occupy the bourgeois standpoint and are totally impervious to the great ideas of freedom of our time'. It was not easy, among the mass of artists who claimed to be 'anti-bourgeois', to find more than a few who were close to the organized socialist movements - ever the anarchists found fewer devoted enthusiasts among the painters than they had done in the 1890s - but it was a good deal easier to discover those who complained about the philistinism of the workers, frank elitists like the Stefan George circle in Germany or the Russiar acmeists, searchers for (preferably female) aristocratic company, and even - especially in literature - potential and actual reactionaries. Moreover, it must not be forgotten that the new experimental avant--gardes rebelled not so much against academicism as against precisely those avant-gardes of the 1880s and 1890s which had been relatively close to the labour and socialist movements of the time. In short, what could Marxists see in these new avant-gardes except yet another symptom of the crisis of bourgeois culture, and the avant--gardes in Marxism except yet another proof that the past could not understand the future? No doubt there were some among the few dozen individuals on whose patronage (as collectors or dealers) the new painters depended who were also Marxist sympathizers. The amateurs of rebellious art were unlikely to be politically conservative at this time. The occasional Marxist theorist - Lunacharski, Bogdanov - might even rationalize his sympathy for the innovators, but was likely to meet with resistance. Yet the cultural world of the socialist and labour movements had no obvious place for the new avant-gardes, and the orthodox aesthetic theorists of Marxism (de facto a central and east European species) condemned them. However, if some of the new avant-gardes certainly remained remote from socialism or any other politics, and some were to become frankly reactionary or even fascist, a great part of the rebels in the arts were merely waiting for a historic conjuncture when artistic and political revolt could once again merge. They found it after 1914 in the movement against the war and the Russian Revolution. After 1917 the junction between Marxism (in the shape of Lenin's Bolshevism) and the avant-garde was once again made, initially mainly in Russia and Germany. The era of what the Nazis called (not incorrectly) Kulturbolschewismus does not belong to the history of Marxism in the period of the Second International. Nevertheless the post-1917 developments must be mentioned, because they led to bifurcation of Marxist aesthetic theory between the 'realists' and the 'avant-gardists' - the conflicts between Lukacs and Brecht, the admirers of Tolstoi and those of James Joyce. And as we have seen this division had its roots in the period before 1914. If we look back on the period of the Second International as a whole, we must conclude that the relation between Marxism and the arts was never comfortable, even though after 1900 it became very much more difficult. Marxist theorists had never felt completely happy about any of the 'modern' movements of the 1880s and 1890s, leaving their enthusiastic championship to intellectuals on the fringes of Marxism (as in Belgium) or to non-Marxist revolutionaries and socialists. The leading orthodox Marxist critics saw themselves as commentators or referees rather than supporters or players in the football match of culture. This did no harm to their historical analysis of artistic developments as symptoms of the decay of bourgeois society: an impressive analysis. And yet we cannot but be struck by the externality of their observations. Every Marxist intellectual saw himself or herself as a participant in the labours of philosophy and the sciences, however amateur; hardly any saw themselves as participants in the creative arts. They analysed the relation of art to society and the movement and gave good or bad marks to schools, artists and works. At most they cherished such few artists as actually joined their movements, and made allowances for their personal and ideological vagaries, as bourgeois society also did. The influence of Marxism on the arts was therefore likely to be peripheral. Even naturalism and symbolism, which were close to the socialist movements of their time, would have evolved very much in the way they did if Marxists had taken no interest at all in them. In fact, Marxists found it difficult to see any role for the artist under capitalism except as a propagandist, a sociological symptom or a 'classic'. One is tempted to say that the Marxism of the Second International really had no adequate theory of the arts and, unlike in the case of the 'national question', was not obliged by political urgency to discover its theoretical inadequacy. But within the Marxism of the Second International there was a genuine theory of the arts in society, though the official corpus of Marxist doctrine was not aware of it: the theory most fully developed by William Morris. If there was a major and lasting Marxist influence on the arts, it came through this current of thought, which looked beyond the structure of the arts in the bourgeois era (the individual 'artist') to the element of artistic creation in all labour and the (traditional) arts of popular life, and beyond the equivalent of commodity production in art (the individual 'work of art') to the environment of everyday life. Characteristically, it was the only branch of Marxist aesthetic theory which paid attention to architecture, and indeed regarded it as the key to and crown of the arts. If Marxist criticism was the fly on the wheel of naturalism or 'realism', it was the engine of the arts-and-crafts movement, whose historic impact on modern architecture and design was and remains fundamental. It was neglected both because Morris, who was one of the earliest British Marxists, was seen merely as a famous artist but a political lightweight and no doubt because the British tradition of theorizing about art and society (neo-romantic medievalism, Ruskin), which he merged with Marxism, had little contact with the mainstream of Marxist thought. Yet it came from within the arts, it was Marxist at least Morris declared that it was - and it converted and influenced practitioners in the arts, designers, architects and town-planners and not least the organizers of museums and art schools, over a large part of Europe. Nor was it accidental that this major Marxist influence on the arts came from Britain, though in that country Marxism was of negligible importance. For at this period Britain was the only European country sufficiently transformed by capitalism for industrial production to have transformed artisan production. On reflection it is not surprising that Marx's 'classic' country of capitalist development produced the only major critique of what capitalism did to the arts. Nor is it surprising that the Marxist element in this significant movement within the arts has been forgotten. Morris himself was sufficiently realistic to know that, while capitalism lasted, art could not become socialist. As capitalism emerged from its crisis to flourish and expand, it appropriated and absorbed the arts of the revolutionaries. The comfortable and cultured middle class, the industrial designers, took it over. The greatest work of H. P. Berlage, the Dutch socialist architect, is not the building of the Diamond Workers' Union but the Amsterdam Stock Exchange. The nearest that Morrisian town-planners got to their people's cities were 'garden suburbs', eventually occupied by the middle class, and 'garden cities' remote from industry. In this manner the arts reflect the hopes and the tragedy of the socialism of the Second International. This paper, originally written for the second volume of the Storia del Marxismo of the Italian publishing house of Giulio Einaudi (Turin, 1978-82) was first published in Mouvement Social, Ill,April-June 1980. Erm, are those dates the right way round? Its a typo, I've edited it. Very nice article. Thank you for sharing your thoughts with us.. Keep up the good work! I am looking forward for more information coming from you.